The cyclone test consists of a missile test and a ballistics test. In the missile test, a 4 kg timber block is smashed at the security screen. View video. In the ballistics test, 5 steel balls with a diameter of 8 mm weighing two grams each are fired at the security screen. View video. Passed. During the missile test, ForceField® withstood a 65 km/h corner impact and centre impacts at speeds of up to 104 km/h. The force of the centre impacts reached 1,659 joules – 16 times more than what is required to pass the Australian Standards dynamic impact test! The steel balls in the ballistics test reached speeds of up to 178 km/h without penetrating the mesh. 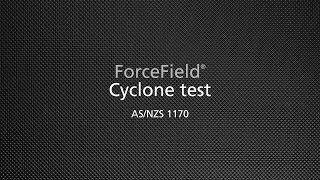 The results of the cyclone test gives you confidence that the ForceField® security screen is the strongest residential security screen on the market. Few if any other standard residential security screens have passed this gruelling test. The US Hurricane & pressure cycle test consists of a missile test and a pressure cycle test. The missile test (Level D) smashes a 4.1 kg piece of timber at the security screen at an impact speed of 54 km/h. The same security screen is then air pressure cycled – simulating various wind directions and wind speeds – 9,000 times at intervals of less than 5 seconds. View video. Passed. Neither test caused any problems for ForceField®. The missile test is less gruelling than the Australian Standards test, which was passed easily. The pressure cycle test report simply states that ‘the specimen showed no resultant failure or duress after cycle testing’. 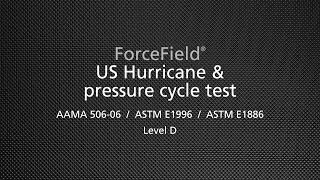 The US Hurricane & pressure cycle test adds further evidence to the fact that the ForceField® security screen is the strongest residential security screen on the market.